The Vancouver Canucks may have themselves a goaltending issue after the team placed goaltender Anders Nilsson on injured reserve Sunday, according to Rick Dhaliwal of Sportsnet. While there was no apparent injury during a game, Dhaliwal reports that Nilsson is dealing with a hand injury and had no idea how long he will be out. It’s a big blow to a young team that has been playing beyond expectations this season as they hold a 6-6-0 record so far this year. Nilsson has been the standout goaltender in net as he has fared better than Jacob Markstrom as the 28-year-old seems to be bouncing back from a rough first year in Vancouver after signing a two-year deal during the summer of 2017. Nilsson has a 2.67 GAA and a .912 save percentage in six games this year, solid numbers for a team that many had picked to be among the bottom teams in the league this year. While Vancouver has a top-flight prospect goaltender in Thatcher Demko sitting in Utica of the AHL, Demko has been doing just that as he has yet to make his debut this season as he is still suffering from concussion symptoms that he suffered in a Sept. 22 preseason game when he collided with Calgary’s Mikael Backlund. Dhaliwal reported Thursday that Demko has seen a specialist and is doing better, but remains at least a week away before taking the next step in his recovery. Instead the team recalled Richard Bachman from Utica, who will serve as backup. Unfortunately, the 31-year-old veteran has struggled in Utica so far this year. In five games, he’s posted a 4.23 GAA and a .865 save percentage, suggesting the team may be in trouble if Nilsson is out for any extended time. After Canada announced their first 18 players yesterday, Sweden has now given us 10 NHL names that will suit up for them at the upcoming World Championships in Denmark. Like usual, their group will include several professional players from the SHL—though top prospect Rasmus Dahlin has already said he won’t be attending. One of the biggest names expected to be on the 2018 free agent market has instead decided to stay put. The Calgary Flames announced this evening that they have re-signed center Mikael Backlund to a six-year, $32.1MM extension. The deal carries a $5.35MM cap hit, while TSN’s Darren Dreger adds that the first two years of the extension carry a $2MM signing bonus, while the final four are purely salary and the deal contains a No-Movement Clause in the first three years and a Modified No-Trade Clause for the last three years. This appears to be a very favorable deal for the Flames. Backlund, 28, has spent his entire career in Calgary after being drafted out of Sweden in the first round of the 2007 NHL Draft. Backlund has since flown under the radar, quietly becoming one of the top two-way forwards in the NHL through his 519 games for the Flames. He is also capable on offense, with 104 goals and 158 assists for 262 career points thus far, including a career-high 53 last season. He has kept up his high-level play at both ends of the ice in 2017-18, on pace for 48 points and considered a candidate for the Selke Trophy with some truly impressive possession metrics. 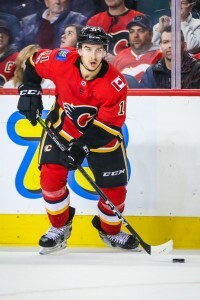 Backlund has proven himself to be a perfect fit as a middle-six center for the Flames and will now hold down that role into the foreseeable future. While Brian Burke, Brad Treliving, and company are surely excited about the extension, the news will leave many other teams discouraged. Backlund was ranked seventh in PHR’s Midseason Free Agent Power Rankings – and had the potential to move up – while ranking second behind only John Tavares among centers. With Tavares also expected more likely to resign than go elsewhere, teams with needs down the middle could soon see their top two targets off the board. Backlund was also set to cash in on his prime position in free agency this summer, so his reasonable extension is even further proof that he was happy to stay in Calgary long-term. The 28-year-old is certainly helping his case for a big contract whether it’s with the Flames or elsewhere for next season. He’s on pace for a second straight 50-point campaign while he’s averaging a career-best 19:15 per night, second among all Calgary forwards. Included in that is 2:25 per night shorthanded which is more than any other Flames attacker. As a result, he will be coveted not only for his offensive abilities but also for his defensive acumen. Francis reports that Backlund is seeking a deal between $5MM and $6MM per year on a five or six-year contract, money that would come close to the pact that Kyle Turris signed upon being traded to Nashville (six years, $36MM). That would also represent a considerable raise on the $3.575MM he’s earning this season. It’s reasonable to expect that he’ll have no trouble garnering a contract in that range if he is unsigned come July based on precedents around the league. Meanwhile, GM Brad Treliving declined to comment on the status of discussions or the asking price, instead simply stating that their goal is to re-sign Backlund. He would be wise to get a deal done before July as if he hits the open market, it wouldn’t be surprising to see the price go even higher with demand expected to greatly outweigh supply for centers in free agency.